CNX-Software just posted that H2 based Orange Pi Zero appeared on Aliexpress for $7. It has been showcased here before, but now is on sale officially, though I can't find 512MB version on the store pages. I'm eager to try 256MB version as my home IoT hub (mosquitto + nginx + uwsgi + Twisted, with MySQL database running on Zyxel NAS). It started with OPi PC then I switched to OPi One but I see it still can be lower spec device. If there was only a schematic of it.. They have not even got out a schematic for PC+ that is out for quite some months now..
- why design a board with Ethernet AND wireless ? If you go wireless, you probably don't need Ethernet and it only heat the board, make the card cumbersome and increase power needs, and if you connect threw Ethernet, unless you intend to create an AP why would you pay for extra wifi ? - no eMMC ! I am very pleased with nanopi air : I connect threw usb and wireless and don't need SDcard, so the pricing is coherent and only CHIP could be a better alternative for me. If it supports passive PoE (which is the case IMO, just look at the comments in CNX link above) and in case Xunlong provides a variant with SPI NOR (also see bottom PCB side) then all you need to connect an ultra cheap data collector (booting from SPI flash and then network, powered through Ethernet too) is such a sub $10 dollar device and an Ethernet cable. Which can then build an AP to connect sensors through 802.11b (max range). I would assume this here is the driver for Allwinner's Wi-Fi radio https://github.com/BPI-SINOVOIP/BPI-M2U-bsp/tree/master/linux-sunxi/drivers/net/wireless/compat-wireless/drivers/xradio (didn't look through already, maybe other modes of operation are also possible). As for 'pay for extra wifi'... I don't know whether you realized that you get an OPi Zero with Ethernet and Wi-Fi for $10.x (including shipping) while the smallest NanoPi NEO (feature-wise almost comparable but lacking Wi-Fi) is at $13 (shipping included). Well, the idea of disk-less slaves systems powered and connected threw Ethernet is interesting. But for "AP connecting sensors", I don't understand well. There are some home automation devices accessible threw wifi, so it is effectively a use case. But if you have range problem, you could use a wifi repeater or a wifi AP CPL adapter. What we need anyway is a mesh network for low energy redundant extensible network : a zigbee or zwave controller on the board or a BTLE mesh implementation. For the price, the problem is not for me the price of the AP, but the connected devices at $50 each. What do I miss ? Commodity is the key here, I think. But what I know is that people buy devices like this (the other cheap Oranges or NanoPi NEO) like crazy and that there are use cases for both Wi-Fi and Ethernet. With legacy kernel it's also easy to save 200 mW by disabling Ethernet entirely (H3 numbers, no idea whether H2+ might show here improvements) and with Wi-Fi it's loading/unloading the driver if you don't need. We could even build Ethernet as module so one can load/unload module when needed (and influence consumption by aforementioned 200 mW). I don't know how much CE/FCC certifications cost but would assume doing this for 2 different devices might increase initial costs in a way that one combined device is cheaper. And hey we're still talking here about the cheapest available H3 device around (ok, H2+ to be fair -- I've still now the slightest idea whether/if changes are necessary compared to current sun8i/H3 code base). BTW: Xunlong's aliexpress shop lists '875 pieces available' for OPi Zero right now. A few hours ago this was 1000 pieces instead. It will be IoT hub (mosquitto + openhab) + esp8266 sensors and actuators. Now I use OrangePiOne + USB_wifi + passive poe injector\splitter. I am just wondering which linux you are planning to install on the board? As far as I understand Armbian is not supporting it (for now, probably). Is H2+ that different from H3? Any benchmarks? why design a board with Ethernet AND wireless ? Yeah!!! Who in their right mind would need more than one network interface??? I only want to see computers nowadays with only one interface, or NONE! But how do you power your IoTs ? Do you use $5 PSU to power $2 esp8266 ? Yes but what about the Total Cost of Ownership ? $5 SDcard, 5$ PSU, $3 cables, $3 enclosure, 3$ heatsink, 3$ antenna, hubs, hours of work to get software working. In a sense, that can explain why they sell much : your interest is to buy many cards to get spares if you spend time on a project and to capitalize on experience with a board ! I think I will invest in nanopi air if I can acquire a bunch of IPX antenna on ebay. I don't use crap $2 esp8266 - https://www.aliexpress.com/item/D1-mini-V2-Mini-NodeMcu-4M-bytes-Lua-WIFI-Internet-of-Things-development-board-based-ESP8266/32529101036.htmlD1_mini best choice IMHO. And don't think about money - I can eat in restaurant for 100$, but it give me less fun, than building my devices, it's a hobby. Well, Xunlong devices with Wi-FI usually ship with a small but suitable antenna (see pictures in CNX or Aliexpress link). And there's no heatsink needed if we're talking about IoT stuff (Armbian contains h3consumption tool for a reason). Then please do a google search for POE-PAN8 or POE-PAN16 (passive PoE injectors), combine that with a suitable PSU and then start to think about TCO in such a PoE scenario. Given SPI flash is populated (maybe on the 512MiB version that will be available soon for $9) and using 2 Zero-ohm surface-mount resistors on the PCB all you need is Ethernet cabling and an appropriate PSU + PoE injector panel, TCO will be pretty low then. You have to calculate/measure voltage drops and in case distance is too high use a higher voltage + step-down converters. These two features (SPI flash + PoE option) really make the difference for me compared to other IoT nodes especially if TCO is considered. Update 2: Schematic uploaded to linux-sunxi wiki. Same SY8113B voltage regulator switching between 1.1V and 1.3V so I would assume all that's needed to support the board is adding xradio driver for Wi-Fi and fiddling around in fex file to support TV out. How on earth have you digged this up? Is there a OPi-Zero page in sunxi site?? If you happen to have such good friends, can you please tell them to give the OPi-PC-Plus schematic too? About the money, the question is principally to deploy the solution : the IoT are necessarily numerous. The prices and the failures are multiplied by number of nodes ... I can no more imagine battery powered devices where you need to change a battery somewhere every second day ! the problem is not for me the price of the AP, but the connected devices at $50 each. What do I miss ? Any why do you want to buy devices for $50 each? I stumbled accross ITead Sonoff devices recently on CNX (ESP8266 based, rather cheap and since a few weeks with CE certification) but stayed away since the idea to use IoT stuff that is connected to someone else's cloud is just bizarre. 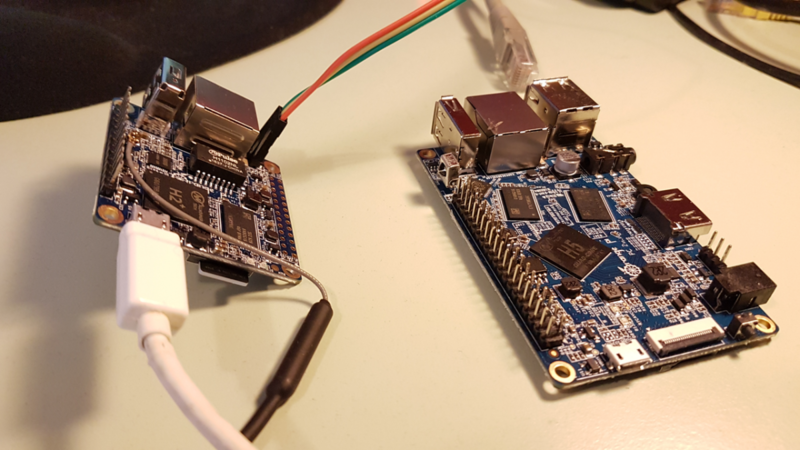 But there is an alternative firmware for these devices by Xose PÃ©rez that solves this problem: https://bitbucket.org/xoseperez/espurna (see also sonoff stuff in his blog). To save costs why not combining this with a few OPi Zero as cheap 'range extenders' that can also be used to control relays, use sensors/actors, use displays of all kinds (ultra cheap LCD stuff, SPI displays, or even CVBS displays able to display movies from 4.3" to 10.1" or as 7" even with touch -- it's just connecting 2 or 4 cables to the 13 pin header)? This new Orange Pi board is exciting to me because it seems to have the best of the NanoPi NEO (small size) but also the best of Orange Pi (built-in wifi, more I/O). Here is my question: I see that this board uses the Allwinner H2+...does anyone have any initial thoughts on what this will change in terms of OS requirements/configuration? The OrangePi website has an Android OS for it, but I like Armbian and am hoping that I can still use it. I'm fairly new (only been learning for about one year) to linux, but I am good with drivers, C++, and following instructions. I have used your tool chain several times to custom configure my Opi Lite, NPi NEO, and NPi M1, but those are all H3 boards. As a side note - I'd just like to say thanks for the great work you all do. I would have given up a long time ago if it wasn't for the wealth of info and resources available on here. (I finally got around to making my first small donation recently!) So thank you for that! I see that this board uses the Allwinner H2+...does anyone have any initial thoughts on what this will change in terms of OS requirements/configuration? I would assume H2+ is just a cost-down version of H3 (less features eg. no Gigabit Ethernet MAC) so everything should work that's working with H3 now after minor tweaks. I would believe all we've to do in Armbian is adding Wi-Fi driver+firmware and adjusting few settings (TV Out instead of HDMI for example). Since the board has FCC and CE certifications, is cheap as hell, can both be powered through Micro USB and PoE (and pin headers), has both Wi-Fi and Ethernet and exposes a few useful connectors on the populated 13-pin header I would assume that we soon see even products based on this small board. Thanks for the fast reply! Okay, so that doesn't sound too difficult. I'm going to try to find the correct xradio driver and see how far I can get. I will have two of these boards very soon, so if there is anything I can do to contribute to getting this board supported, please let me know...I am eager to give back to the community. Would the Opi Lite image be a good starting point? It looks like there are many similarities between these boards (voltage regulator, SDRAM). It would be nice also to have a "h2consumption" tool to play with using the Opi zero as a low power IoT node, but I guess I can change settings manually for now. Regarding Wi-Fi still firmware is missing (and we're waiting for some sort of an SDK). Best starting point would be the image for NanoPi NEO due to single bank DRAM configuration (lower DRAM clock speed). But this is stuff that has to tested. Currently looking into getting this stuff off of Baidu and on an EU/US mirror. If we succeeded we spread the word. .. If we succeeded we spread the word. Edit: Spread wrong information first but in H2 tarball also u-boot and kernel sources were provided. Would there be support for BT on the WiFi driver? There is IR rx pin support. But a Bluetooth remote control costs about the same, and doesn't need line of sight. WiFi is planned, BT also. Opi zero (and PC2) just arrived on my desk today and I got Armbian running on it in no time We need to add wireless drivers and apply fine tuning ... PC2 will be tested later. Can you provide armbianmonitor -u output?